William Morrow Paperbacks, 9780061689376, 464pp. Two young lovers find themselves ensnared in a seemingly supernatural web that ties them to a young girl’s disappearance fifteen years earlier in this dark and twisty tale from the New York Times bestselling author of Island of Lost Girls and Promise Not to Tell. 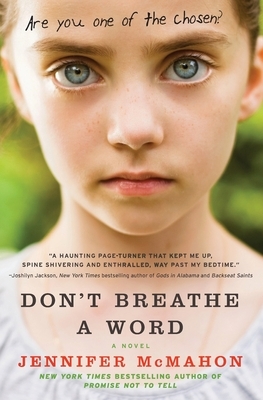 Jennifer NcMahon returns with a vengeance with Don’t Breathe a Word—an absolutely chilling and ingenious combination of psychological thriller, literary suspense, and paranormal page-turner that will enthrall a wildly diverse audience including, among others, avid fans of Keith Donohue (The Stolen Child), Laura Lippman (I’d Know You Anywhere), and Tana French. (In the Woods). Throughout the book, there are a lot of references to fairy tales. How do you think fairy tales mold children's perceptions about the world? In what ways do fairy tales represent or mimic real world problems and fears? How do you think the Evie/Lisa relationship and the Phyllis/Hazel relationship parallel each other? Does one woman in each bond hold sway over the other? Is it always apparent who's really in control of the situation? Throughout the book, it seems as if some men, or the idea of a man like Teilo, hold a strong power over the women. Why do you think this is? How are those men different from Sam and Dave? Lisa's unwavering belief in the fairies, despite the skepticism of everyone around her, is a driving force in the story. Is a fierce belief in something a strength or a weakness? At one point, Sam states that instead of having cancer and heart disease passed down in their family, they have malevolent stories. Do you think the stories we tell have the power to shape, even change, reality? Are there stories that have been passed down in your family that, true or not, have become part of how you see yourself and where you come from? We get to know Sam and Evie both as children and as adults. How do you think their childhood selves compare to their grown-up selves? Do you think the adults they became were shaped by what happened the summer Lisa went missing? Part of the book is told from the point of view of Sam's present-day girlfriend, Phoebe. She is the one character who was not part of the story's central mystery, Lisa's disappearance. Why do you think the author chose to tell the present day story from Phoebe's perspective? Is she an effective narrator? From an early age, Phoebe has a complicated relationship with men and their place in her life. How do you think this affects her relationship with Sam? How do you think it affects her ability to trust? Evie, in some ways, is the most complicated character in the book. She is fiercely loyal to Lisa, yet she betrays her terribly; she wants the truth to come out, yet participates in the deception. Does Evie truly have Lisa's best interests at heart? Is she responsible for all of her actions? The ending of the book is open to different interpretations. What do you think really happened?